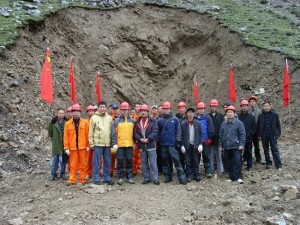 Chinese officials and mine workers during the opening ceremony of a mine in Shethongmon, 2007. TibetanReview.net, Feb13, 2011 | Many Tibetans, including the abbot of a local monastery, had been severely beaten and held for protesting against the carrying out of rampant mining work at Tamo township in Shethongmon (Chinese: Xietongmen) County of Shigatse Prefecture in southern Tibet over a period in November-December, 2010, said the exile Tibetan government on its website Tibet.net on February 11th. The report said the crackdown was carried out by riot police and security forces, including with reinforcement from Shigatse Prefecture, so that the troops outnumbered the protesters. Abbot Kelsang, 49, and monks Jamyang Tsering, 38; Tsewang Dorje, 37; Rigzin Pema, 35, and Jamyang Rigsang, 34, of the local Lingka Monastery were reported to be among those arrested. In addition, around 12 lay Tibetans protesters were reported to have been arrested, although two were later released. Those detained were said to be held at different detention centres near Shigatse and in Shethongmon county. The report said that when the local Tibetans initially tried to stop the mining work, local government and mining officials tried to sweet-talk to them while continuing the mining work. But the Tibetans refused to be taken in and continued the protest from 22 November to 18 December 2010, after which the violent crackdown was carried out. It was reported to be a government-run mining operation. Chinese mining work in Shigatse had attracted local Tibetan protests before. Tibet.net noted that on 5 June 2010, around 30 Tibetans were severely beaten and detained in Sogchen village of Namling county after they staged a protest against mine work being carried out in their area. Their whereabouts still remain unknown. encouraging to see my phayul warriors doing something big against mining today. tomorrow its me, for azadi! Its great that the people of Shigasté took the risk and the responsability to express their opinion with regard to exploitation of their natural resources. I hope the regional authority will take their part of responsability to: hear their plight….to make sure to speak and controle against abusive exploitation of the mining site. respecting environement and the unjust oppression of their people’s opinion .